So, this is one of my favourite outfits that i've put together in a while. 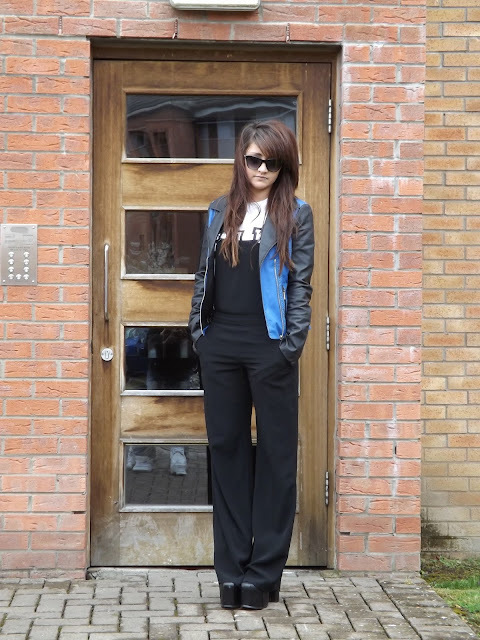 I love my dungarees from RI and the Jacket looks aaamazing! The jacket's from Daisy Street which is now my new Missguided, haha! I saw it in their New In section and fell in love. It's extremely comfy and has a gorgeous leopard print inside. I'm all about trying new things and the blue is quite unusual for a faux leather jacket but the colour is lovely and works well with the black. I got the dungarees from River Island about a month or two ago but i'm sure they're still in store? I saw them online and loved them so had to go check them out in store the next day - of course i got them. Some of you may have an old pair sitting in the back of your wardrobe somewhere so don't be afraid to get them on again! I had denim dungarees when i was a kid and wore them all the time - I still love them! :) These come in a few different colours and patterns aswell which is great for summer - If it ever comes? Love your blog+ style, and have serious hair envy haha! Love this one!! There is something so elegant about black dungarees. Dont Forget to Check out my Re-desing Monday's post this evening!! I was too focused on your hair to even notice the clothes! I need my hair to be long again so I can style it like your's. River Island makes amazing items, love them! The piece looks great on you, and doesn't it look like it really elongates the legs? Love this one aswell!! :) Great combination!! This is so cute - I don't think that I could pull overalls like that, but you look So. AMAZING. Also, that jacket is just so perfect! Loving this outfit! It flows really well.